Tillman Talk: Are We Still in a Recession? 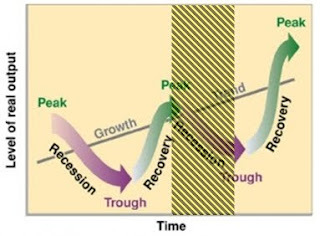 The recession is the shaded area that begins at the top of the business cycle and ends at the bottom of the trough. If one asks a non-economist about this definition, they’d tell you that there was something clearly wrong here. A non-economist is most likely to describe a recession as not being over until at least the time when we recover to the trend line. Anything before that, we have a “depressed” economy. If you ask an economist how long the Great Depression lasted, you will get the answer that it started in 1929 (Spring 1929, if it’s a good economist) and that it ended around 1939/1940. However, if we truly look at the data, we see the following ups and downs over this period. As indicated in the graph, the shaded areas indicate recessions. What we see is that, technically, there was no such thing as “the Great Depression,” but rather a steep, prolonged recession, a slow recovery, followed by another recession. Does this graph seem similar to what we are currently experiencing? Will there be a second recession? Will this be called the Second Great Depression by future economists? Only time will tell. It was for these reasons that I have helped to create the Distress Index and update it monthly. You can see it on the left hand side of this blog. It helps us to see where we are in the greater schema of the economy. Any number above a 47.0 seems to indicate that there is a fair amount of distress in the economy. So check back frequently to see the updates.